Wow that 22 rebound game by David Lee was also his career high. He must of been in scintillating form this year. Shame one of the games premier defensive rebounders can't actually defend! Your stat knowledge is pretty incredible BF. Interesting that the team rebounded better without Lee. Shows you that the team as a whole has improved so much. Still, Lee is a very good rebounder and that is something that makes him valuable. I'd be interested in a comparison of Lee and Love. Not just for rebounding, but all up, though rebounding and defense is the most notable. migya wrote: Your stat knowledge is pretty incredible BF. Interesting that the team rebounded better without Lee. Shows you that the team as a whole has improved so much. Still, Lee is a very good rebounder and that is something that makes him valuable. Essentially, Love is the superior player in everything but passing/handles - which are more of a luxury than a prerequisite for a PF anyway. He's no defensive stud, but he's not retardedly below average like Lee. And as far as rebounding... Lee is an A- and Love is an A+. You can't go wrong with either, but Love is the best pound-for-pound rebounder in the game and literally does everything right on the glass. Lee goes after everything, but he slacks on boxing out so he surrenders big games as often as he collects them. Love has no rebounding weakness; he snatches every board and he keeps his man off the box score too. Yeah, I agree, individually he is our best rebounder. I think it's possible we try to leak out more with him on the floor because of him so he can get more rebounds, but that also means we rebound less in general. Without him on the floor everyone is trying to get the ball and it leads to use rebounding better. Either way, it's not a problem rebounding wise to not have him off the floor. Only stat we drop in without him in is offense and it's a pretty big drop. So he is very important. Love seems so much better than Lee. His basketball smarts are off the charts. He does need to improve his defense to possibly be an alltime great by his career end . And that's just it; he IS improving defensively. His DRtg was 109 his first two years (which is beyond pathetic), but has dropped to 108, 104, and (in limited action last year) 102. He's still a 107 on his career, but it appears he's made it a priority in recent years to become a better defender. 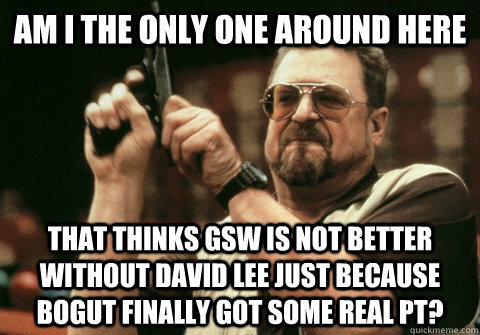 David Lee's career DRtg is 108. He made a marked improvement last year that most of us noticed, but he still topped out at 104 (which was a new career best). Like I said, Love is marginally better than Lee defensively. He is getting better at defense, but it's probably peaked at this point. Doubt he improves beyond this bad defense. And I think Love can get even better on defense. His team plays better on defense with him on the floor already, which is something Lee has yet to accomplish. So even though Love is only marginally better on defense right now, I believe his ceiling on defense can widen the gap where it's not a discussion. At times, Lee plays up and shuts down top tier PFs though. I wish he did it all the time but guys like Love, Gasol and even Dirk don't like lining up across from him. He's also an underrated dirty player, I wish he'd stop shoving jump shooters for no reason, but he gets away with a lot of chippy plays. Forgive me if it's already been mentioned, but lets not forget that Lee has been given some tough assignments over the past few years being our only decent big - he's straight played the 5 and guarded 5s countless times. I don't believe that's his game (low-post defender). That is what Bogut is for. With a healthy front court of Bogut and Lee, the spotlight on David's defensive deficiencies will dim; Bogut protects the rim, Lee inhales rebounds, and they both will realise their true offensive potential playing with skilled, intelligent guards like Curry and Klay - INDEFENSIBLE! 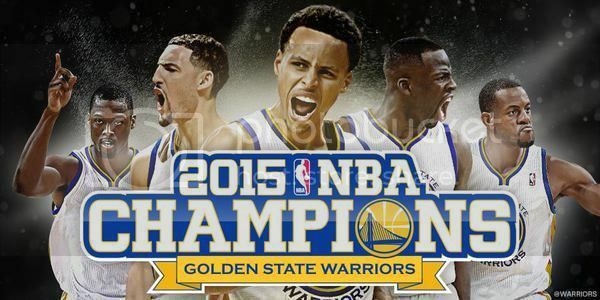 IMO, Curry's D is sufficient. He is smart and knows how to be in position. He certainly didn't fall for the same sh*t Jack did against the Spurs - seriously, how many times are you going to let a team/player run the exact same play (consecutively) on you before you take a hint? Maybe that was MJax's fault, but as a player, you need to do something. Also want to point out that though defensive rebounding is imperative to closing out the defensive possession and this integral to overall defense, the fact that dlees defensive rebound numbers tell me that he doesn't challenge the original shot. Most shot blockers/ rim protectors tend to have lower d rebounds because they're out of position trying for the shot block. David's biggest problem on d is that he sacrifices challenging the original shot in order to box out and secure the rebound. Bogut also had this issue in the playoffs. 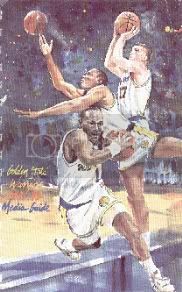 JebronLames wrote: Also want to point out that though defensive rebounding is imperative to closing out the defensive possession and this integral to overall defense, the fact that dlees defensive rebound numbers tell me that he doesn't challenge the original shot. Most shot blockers/ rim protectors tend to have lower d rebounds because they're out of position trying for the shot block. If you think Chandler is a better shot blocking defensive presence than Bogut than you are wrong. Bogut is one of the most pure defenders in the NBA. If you think Chandler is a better shot blocking defensive presence than Bogut than you are wrong. Bogut is one of the most pure defenders in the NBA when healthy. Fixed that for you, bro. +1 Blackfoot. As others have mentioned, hopefully Bogut will be healthy next year which we help Lee's defence. I'll take Jebron's comments in relation to Bogut with a grain of salt as he was the same person who wanted Biedrins to play more minutes than Bogut in the playoffs.